Visitors to Tijuana Mexico or Ensenada only need to walk (or drive) across the border. Since Tijuana Mexico Thrives on tourism (being the most touristed city in the world), the authorities in Tijuana try to make entering Mexico as quick and easy as possible. There are no declarations to make, and no questions will be asked. 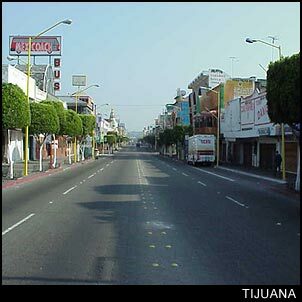 If you want to visit Tijuana, just come on in. If, however, you are planning on staying for more than 72 hours, you will need to get a tourist card on your way in (ask for directions at the border). A trip to Tijuana Mexico can be a great time for everyone if you bear in mind that Tijuana Mexico is the busiest border crossing in the world, and a party crowd that big is bound to have its share of rabble rousers. You will find the Tijuana Police Officers to be very friendly and helpful. But they do have a job to do, so here are a few tips to make sure that your visit to Tijuana is pleasant and safe. If you choose to drive across the border make sure that you get Mexican auto insurance before you do. It is not required (by Mexican law), but if you get into an accident and you cannot show proof of Mexican auto insurance, you will be held in jail until blame can be accessed and damages are paid in full. You can obtain Mexican auto insurance (which may be purchased by the day at a very reasonable rate) but we highly suggest that you get some before driving across the boarder. The "NO SYMBOL" over an "E" is the same as the "NO SYMBOL" over a "P" in America; it means NO PARKING. If you park in a no parking zone, don't be surprised to return to your car and find that it has been towed away. If your car has been towed you will need to go to the Police Station (8th & Constitution) and pay your fine before the vehicle can be released. The Tijuana police advise tourists not to travel below Third Street on foot after dark. So if you walked across the border and are planning on returning after dark, you are advised to take a taxi and avoid the risk. Carrying a knife in Tijuana with a blade of 4" or more on your person is considered carrying a concealed weapon. Knives in shopping bags, however, are OK. Drinking on the street or carrying an open container in Tijuana may be considered public intoxication. Such activity is not legal, and the police try to keep the tourist areas safe for everyone, so don't be ignorant. Prostitution is something that can be found in any large city. Some Americans are under the mistaken impression that it is legal in Tijuana Mexico (as in Nevada) -- Be advised that it is not legal, and that you should try to keep any extra-curricular activities discrete. - That being said, I will also remind you that a condom may not be guaranteed protection against communicable diseases such as aids, but it is the safest option, so keep a rain coat in your pocket or keep it in your pants. When crossing the border from Tijuana into the United States: if you are not a US citizen, you will need a valid passport and visa -- if you are a US citizen it might still be wise to carry some sort of ID. Prohibited Items : lottery tickets, narcotics and dangerous drugs, obscene articles and publications, seditious and treasonable materials, hazardous articles (e.g., fireworks, dangerous toys, toxic and poisonous substances), switch blade knives, drug paraphernalia, and many meats & fruits (see customs for a complete list). Prescription Drugs : may only be imported from Tijuana if you have a prescription from a US doctor (90 day supply only). Prescriptions written by doctors in Tijuana or other cities in Mexico are no longer considered valid.